Fort Worth, and Texas in general, is not a place most people think of when they think of rats. Texas is more commonly associated with pests such as armadillos, snakes, or skunks. While these are definitely problems for homeowners and business owners, rats are an issue as well. Building owners must stay knowledgeable about rats to protect themselves from their diseases and damage. Critter Control of Ft. Worth is here to supply you with some crucial Ft. Worth rat facts. At Critter Control, we’re dedicated to helping customers learn Ft. Worth rat facts that will protect their homes, families, and pets. For example, it’s crucial to know the types of rats you may be dealing with. The most common rat found in American homes is the Norway rat, or Rattus norvegicus. These rats have several aliases – wharf rat, brown rat, and sewer rat. They are not always brown, although this is a common color. Rats have long teeth, pointed noses, and are fairly large in size. Some rats can grow to about 40 cm long. Our Ft. Worth rat facts also encompass the type of damage Norway rats and similar species cause. 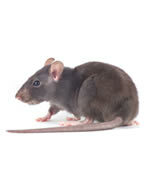 Rats chew on wires, which can cause electrical, heating, and water problems. If not caught early, chewed wiring can lead to fire hazards. Rats also commonly chew and soil insulation and building materials, especially in attics. Rat waste carries diseases that humans usually come in contact with when trying to clean it up. Additionally, rats are notorious for stealing and contaminating food. They spend much of their time in garbage bins and other filthy areas, but like to eat grain and flour as well. Pet food is another favorite of most rats. If rats are common in your area, you should keep your food supplies as secure as possible and never leave them in the open. Contact Critter Control of Ft. Worth for assistance with rat infestations.